The exact date and circumstances of the origin of yoga are unknown. This is because the practice of yoga is so ancient that it is believed to predate the written texts and visual images that depict it. Most scholars trace the origins of yoga to at least 5,000 years ago. Yoga is believed to have originated through the insights and experiments of ancient seekers of wisdom, mystics, and visionaries on the Indian subcontinent. Through intense inner searching, they developed practices that were passed down orally and eventually recorded in a body of text that is considered sacred in the Hindu and other spiritual traditions. The earliest known writings on yoga are contained in the Vedas (Sanskrit for "knowledges"), the most ancient extant Hindu texts. The oldest of these, the Rig-Veda ("Knowledge of Praise"), believed by some scholars to date as far back as 3000 b.c.e., contains plentiful references to yoga.2 Other ancient sacred Hindu writings, including the Upanishads ("to sit down close to one's teacher"), helped to codify the oral tradition that formed the basis of yoga. Some of the earliest and most influential writings on yoga are the Bhagavad Gita and the Yoga Sutras of Patanjali. The Bhagavad Gita ("Lord's Song"), which forms a part of the epic Mahabharata ("Great Story of the Bharatas"), is believed to have been composed between the third and fifth centuries b.c.e. Consisting of approximately 700 stanzas, the Bhagavad Gita contains crucial instruction by the Hindu god Krishna to the warrior Arjuna on the principles of yoga. The precepts he presents continue to guide the practice of yoga today. The Yoga Sutras (sutra means "thread" in Sanskrit and is related to the English word suture) is a series of terse aphorisms or maxims that distill the essence of yoga thought. These aphorisms total 195 or 196, depending upon the source text. The Yoga Sutras are ascribed to the yoga authority Patanjali, who is believed to have lived between the second and the fifth century c.e. Patanjali is often called the "father of yoga," although his real contribution was to codify existing knowledge of yoga and help provide it a place within classical Hindu philosophy. One of the most seminal and well-known texts on hatha yoga is the Hatha Yoga Pradipika ("Light on the Forceful Yoga" in Sanskrit), written in the 14th century c.e. by Svatmarama Yogin. 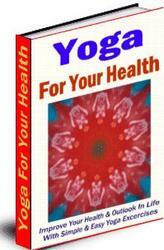 This text is considered by some scholars to be the most influential text on hatha yoga, the branch of yoga that deals most specifically with the physical discipline of yoga. Yoga is much more than an archaic codification of information, however. It is a living system of knowledge. Since its inception millennia ago, yoga has continued to grow and evolve. From its origins in prehistoric India, it has been embraced by many systems of thought, including Buddhism, and has become an integral part of the cultures of a number of other countries, including Tibet, Pakistan, and many other Asian civilizations.